UK bank Barclays has bought some of the core assets of US investment bank Lehman Brothers for $1.75bn (£1bn). Barclays bought Lehman's North American investment banking and trading unit for $250m, and paid $1.5bn for its New York headquarters and two data centres. Meanwhile administrators for Lehman in the UK said there was interest in LBAM (Europe) and Lehman Brothers Europe. The first is an asset management firm and the latter a corporate finance advisory business. Both businesses are solvent and trading. “We are also taking a keen interest in developments with Lehman Brothers in the US," the administrators, PricewaterhouseCoopers, said. There was also some good news for the staff in the UK. The administrator said that all UK staff who are still employed at Lehman (which is the majority of the 4,500 employees), who are still turning up to work, will be paid by the end of the month. This was the payment that they were due to have received on Friday. Barclays also confirmed that the company was considering employing some of Lehman's UK staff. In a news conference, Barclays president, Bob Diamond said the company was looking to add talent from the UK and Europe to the US deal, but it was an opportunity not an obligation. He said that the options were mainly in the equity and equity capital business. When asked about how quickly Barclays would move to acquire some of Lehman's London employees, he said: " We are already acting on the opportunities that we think are available to us." Lehman - the fourth-largest investment bank in the US - filed for bankruptcy protection on Monday. The US deal, which comes after a weekend when Barclays refused to buy all of Lehman, needs bankruptcy court backing. BBC Business Editor Robert Peston had said earlier that Barclays would not be interested in acquiring Lehman's "toxic investments in the residential and commercial property markets". As part of the investment banking and trading operations, Barclays is acquiring Lehman's fixed income, equities sales and research departments in North America. The deal could safeguard the jobs of about 10,000 US employees working in the divisions. The agreement was made not long after Lehman's first bankruptcy hearing in a US bankruptcy court in Manhattan. John Varley, chief executive of Barclays, said the proposed acquisition was part of a policy of "profitable growth on behalf of our shareholders". He added that it made good sense, strategically and financially. 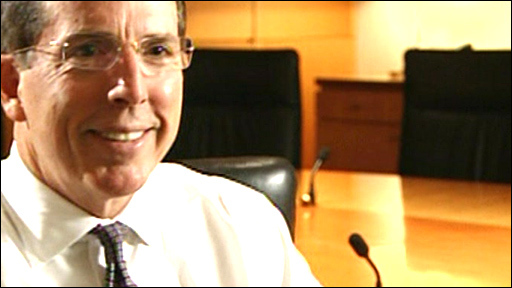 The company's president Bob Diamond said: " Lehman brings top tier excellence to Barclays Capital." Lehman Brothers chief operating officer Herbert McDade said: "We have the opportunity to continue the growth and development of our US investment banking and capital market franchises with one of the leading financial institutions in the world." The deal is subject to regulatory approval and Barclays have stipulated that the acquisition may be stopped if it is not completed by 24th September 2008.